Phoebe and Dudley are both rescues, who I brought home 4 and 2 years ago, respectively. 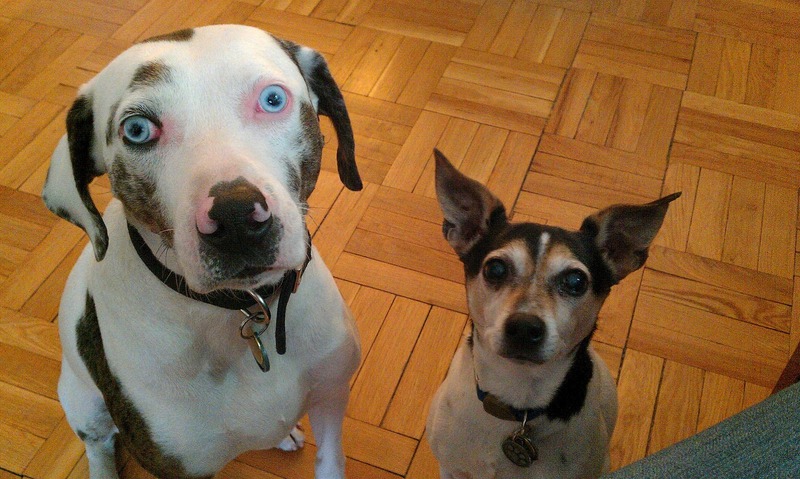 Phoebe is a Catahoula, rescued from the THS, and Dudley came from Rat Terrier Rescue Canada. I got Phoebe after a particularly hard time in my life, and she has been great company for me. The decision to rescue Dudley was made when I realized that Phoebe needed some company to help her get over some pretty noisy separation anxiety (I'm not sure that worked, but he is a great little guy so I really don't mind). As the picture illustrates, they love to "help" when I am working at my desk. Here's the link for details on the latest photo contests.